A great small town. And the Queen Mine Tour. Nobody said a pair of 6146s was "better" than a 4D32. What I wrote was that interest in the 4D32 went away. Interesting history. There's also the question of how many 4D32s were needed for 32V-1/2/3 and HT-20 transmitters vs. Viking I rigs. Another fun fact is that the Viking I wasn't TVI proofed. Johnson came out with a TVI kit and instructions for installing it - the instructions say it was essentially the same as the June, 1952 QST article about TVI-proofing the Viking I. The Viking II was designed with the TVI-proofing features. The 1950 Allied catalog lists the 4D32 at $9.75 and its socket at $1.76. By the 1953 catalog, the 4D32 was $22.40. Meanwhile, the 1953 catalog lists the 6146 at $9.80 for a pair. Interesting story - but - the Allied catalogs of the 1950s and 1960s continue to list the 4D32. They even give quantity prices. The problem is that the prices keep rising - the 1958 catalog shows the 4D32 at $30.95 and the 1963 shows it at $32.76. The 1968 catalog has the 4D32 at $74.30! Meanwhile the price of a pair of 6146s stayed below $10. Yes, the rigmakers didn't buy their tubes from Allied. But many a ham would at least check the catalogs for prices, and when they saw such prices for a final tube, they'd be likely to pass by a rig that used it. Nobody said that old rigs "got parted out en masse". Only some did - and often the parts went to keep others alive. More than a few great old rigs wound up in dumpsters because nobody wanted them, or because they'd been stored improperly for a long time, or because their owner was SK and the family did not know what to do, etc. The point of the story I told seems to have been bypassed, though. It is simply this: Buying, keeping (hoarding!) old radio stuff with the idea that it is or will become rare and expensive in the future is a very risky game - the price of 4D32s proves it. When you toss inflation into the mix....there are much better investments. OTOH, if something is bought, used and enjoyed - so much the better. The one I bought in 56 had the kit, I added a Johnson LPF. ER had the correct V-II production figures including the CDC but I dont remember them. Mine was built in 64, the last year and was installed at the GM Proving Grounds and was stored in a room until I bought it. Looks almost new inside. The real story is that stock was still available at the dealers for some years and when that dried up others were supplying them at a big profit. Id suspect both Collins and Hallicrafters. 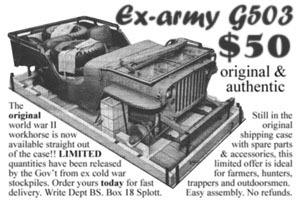 But could you get the surplus jeeps stored in cosmoline on radio row? As a kid, I saw these things advertised in Popular Mechanics. I wanted one sooooooooo BAD! Never had the money, never knew what the "catch" was. I just recently sold my '51 M38. As a kid, I just couldn't WAIT to get my Fair Radio Sales Catalogs or my Allied and Hallicrafters. It seemed to take WEEKS for them to arrive, at which time I would closet myself away and read them like a novel! In the 60's and 70's there was a kind of "radio row" on Morehead Street in Charlotte, NC. One of the stores sold ham equipment and I bought my first Master Mobile antenna from a pipe-smoking guy named "Mel". I don't remember his call, but I used to see him at local hamfests for years afterwards. There was also a warehouse down there owned by a fellow named "Cornell", I believe. It looked a lot like the New York stores mentioned here. There were rows and rows and ROWS of tubes, caps, surplus radios, widgets, wadgets, and gadgets--stuff to keep the radio buff like me occupied (and out of mischief) for hours and hours and---well, you know. I could lose a whole Saturday in there, sometimes finding a gem of a receiver, a transmitter, a dynamotor---but you had to crawl vewwy, vewwy, carefulwe across boxes, climb UP and over cabinets ever so eeeeeeeeeeee-ze so not to cause an avalanche that might take YOU with it. I couldn't let GO. I just had to see what was in every "mystery box" I could. It was an addiction, I tell ya! The store/warehouse had several moves; one was down S. Kings Drive, another was, I believe, off West Blvd, another to South Blvd in a store front. I dutifully followed. One time, he had bought a whole LOT of VHF antennas (jeeps, maybe?). They had a small coil at the base and a rigid rod above, with a small flexible whip on top. They were adjustable with a knurled nut, and a mating rod slid up and down inside. They made excellent 2 Meter antennas, and were marked with frequencies from 130-something to 160-something. They were in bundles, still smelling of cosmolene. I bought a passel of 'em and sold them at hamfests for a few bucks apiece. Still got ONE of 'em. There was also a warehouse down there owned by a fellow named "Cornell", I believe. Yep! I remember him well. After he passed his son took over. They seemed to move about once a year. The real ham bonanza was when they scarffed up much of the surplus from the Hammarlund Mars Hill factory. They had the spare parts for everything being made in recent years. Dials, panels, tuning caps, IF cans, etc. that would be worth a (very) small fortune now. I found the 160m coils for my HX-50A transmitter in boxes of 100. I don't recall if it was Cornell (Jim?) that had the shop on East 4th at Cecil St. That area has since all been redeveloped as part of the CPCC campus. What was Cecil St is now more or less S. Kings Dr. I was wanting to build my first crystal radio and my dad took me there. He worked in an adjacent building and happened to know the place. I guess I was about 12. They really didn't have anything to help me but I got an education just the same. What I remember most was a big barrel like a pickle barrel full of mixed resistors. "Find your own"
What I remember most was a big barrel like a pickle barrel full of mixed resistors. "Find your own"
What happened to pickle barrels? I used to subcontract (consult) for Norden Systems in CT (United Technologies later) and they had WW2 bomb sights in their lobby, along with photos of the "Pickle Barrel Club," which were the Bombardiers who were so good using a Norden sight they could drop a bomb into a pickle barrel. I miss pickle barrels. Haven't seen one since I was a kid. But all our local delis had them then...five cents for a pickle. The implication was the same. You inferred what was not implied. OTOH 6146's were failing from excessive grid current in Johnsons, Heath and others. They failed due to operator error. The Viking II manual says 6 mA of grid current for two 6146s, which is well below the published tube data limit of 7 mA (CCS) or 8 mA (ICAS). Of course someone has to read the manual and follow it! Also competition - several manufacturers made the 6146; AFAIK, only Raytheon made the 4D32 and its cousins. ER had the correct V-II production figures including the CDC but I dont remember them. The Electric Radio article says there were 3,383 Viking 1 transmitters produced between 1949 and 1952, and 10,118 Viking 2 transmitters between 1952 and 1961. Of course a transmitter might be produced one year and sold in another. The ER numbers and dates were provided by KB9IV, who worked there. You were first licensed as KC4KWH in 1989.....right?